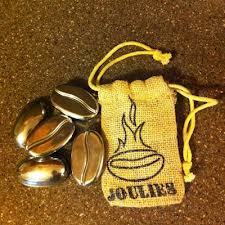 Coffee Joulies are jewels you add to your coffee. This is an invention, that I must say, I really like. If you have ever tried to drink coffee when it was either too hot to drink or already cold enough you are constantly needing a refill, you may also be interested in the Coffee Joulies. Getting your coffee to the exact temperature that you prefer has always been a constant problem, until now. 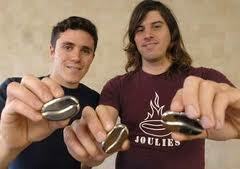 The Coffee Joulies are actually replicated to look like a coffee bean that is made out of stainless steel. By adding a few coffee joulies into your hot beverage, it starts a chain reaction that is determined by how hot the temperature is. When you first pour a cup of coffee that is above 140 degrees and hot enough to burn your mouth, the Coffee Joulies (magic coffee beans) go to work and bring down the temperature to the optimal level. These beans then store the extra heat generated and will begin releasing the heat back into the coffee's temperature giving you a perfect cup of coffee over an extended period of time. 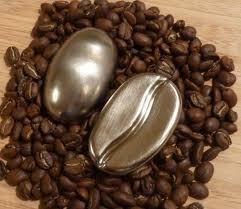 What is so magical about these metal beans is whats inside the stainless steel shell. The thermodynamics that captures the heat to a certain temperature and then releases it back into your coffee, tea or hot chocolate, is a special non toxic material that actually melts and liquefies at temperatures above 140 degrees. As your hot beverage begins to cool below 140 degrees, the Coffee Joulies begin to revert back to a sold form and release the stored heat back into your coffee. If you would like a scientific explanation on how this invention works, this is a great article that explains the heat transfer of the Coffee Joulies. They claim that your coffee will cool down to the optimal temperature 3 times faster then normal (by blowing off the steam) and will keep it hot at that temperature for at least twice as long. 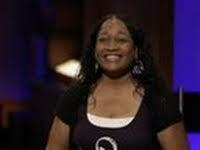 Will Coffee Joulies Be A Big Success on the Shark Tank Show? If your are like me and drink your fair share of coffee every morning, it's easy to see what the benefit's of using Coffee Joulies would be. In fact, it's one of those inventions that you will probably wonder how you ever did without it once your accustomed to having that perfect cup of coffee, every single time. I must say when I first seen this product, I was a little sceptical to say the least. Putting metal beans in my coffee was the last thing I would of ever thought of. But thanks to 21st century technology and two very creative geniuses, it appears that the elusive "perfect cup of coffee" over an extended period of time, is now a reality. As we all know the Shark Tank likes to see prior sales. The more successful your product is pre-Shark Tank, the better deal you are likely to make while on the Show. Coffee Joulies is yet another product that first got it's big boost from Kickstarter.com less then two years ago. With a very unique invention and a reasonable goal of only $9500.00 the two Dave's set out to change the way millions of people drink coffee every morning. There is a growing list of successful companies that made it on the Shark Tank Show, but none that I can recall that raised over 30 times what they were originally asking for. By the time their KickStarter campaign was over, the two Dave's managed to raise over $306,900.00 from over 4,800 backer's in just a little over a month's time. This also made Coffee Joulies as the third most successful product launch in Kickstarters History. Very Very Impressive I must say and I believe that ALL the Sharks will feel the same way. This is a brand new invention that will appeal to millions of coffee drinkers around the world and the Shark Tank may only have one chance to made a deal. A Major Deal at that! Another QVC play coming from a Shark Tank Invention is practically a given. We will soon see Coffee Joulies on QVC very soon IMO. It's just one of those inventions that would do very good on a platform where it could be demonstrated first. Depending on if they hold a tight enough patent on the coffee heating invention, this could also make for a great licensing deal with the larger coffee houses such as Star Bucks. No need to put the Coffee Jewels in your coffee yourself, just exchange them for already pre-heated ones with your next order. 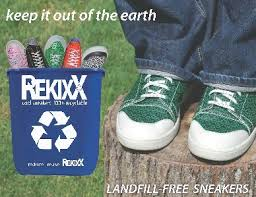 They could also have their logo on the metal beans and practically guarantee that you will be back to exchange them for another cup in the near future. There is Lot's of possibilities for this rather unique invention. The question is how much equity will the two Dave's be willing to give up to make a deal on the Shark Tank? I can't imagine they are too concerned with money with such a successful start up campaign, so they must be looking for other skills that the Sharks bring to the table. IMO all of the Sharks could add value to this particular invention in one form or another. But looking at their recent "social timeline" makes me question if they actually were able to make a deal. Completely selling out on Amazon too soon before Christmas is a good thing, or is it? Dave Jackson and Dave Petrillo confidently walked into the Shark Tank dressed for success in, ah, T-shirt's. We'll at least they had the Coffee Joulies Logo on them. They were asking for $150k for a 5 % stake in the company valuing it at $3 million to start the negotiations. The Joulies cost's $3.65 to make and retail for $50 for a set of 5. Sales totaled $575k for last year with a $50k profit. They are already cash flow positive. Projected sales for this year in Joulies is over a million dollars. Kevin O'Leary professes that in any start-up company he wants at least 33% before he's interested. He will however, give them the $150k the two Dave's are asking for, but he wants $6 for every Joulies set sold until he gets his money back, and $1 in perpetuity (for life). Lori Greiner almost immediately says she will go in the deal with Kevin. O'Leary really likes the idea of getting Coffee Joulies on QVC and agrees. Robert Herjevic follows Lori's lead and adds he would also like to go in the deal and bring his contacts with Bed Bath and Beyond and Target into the equation. Daymond John, who dropped out very early because he didn't think he could add much value, picks up on the other Sharks starting to swarm all over this deal, and graciously asks to also go in on this deal. They now have 4 Sharks on the hook which seems like a very good deal for all parties. The two Dave's get the money and the Sharks contacts they need to expand and the Sharks each get a share for only $37,500 each. Mark Cuban, the lone Shark and never to be out done, offers his own deal and his way of thinking in how the Coffee Joulies should be marketed and sold. He offers them $250k and only wants 12% of the business with the stipulation that they Do Not go the QVC route right away. He believes there is more value in building the Brand first, and then selling the company to a larger retailer. The two Dave's decide to take the phone a Friend Option to discuss the offers. Robert quickly realises that the $6 per set at wholesale is way too much to take at this stage of the company's grouth and wants to change it to $3. If they don't change it, they may lose the deal to Mark Cuban. Cuban is sitting back thinking he's got this in the bag. O'Leary gets up and walks out of the Shark Tank to the two Dave's and announces they only want $3 per whole sale order. It's not very often when you have all 5 Sharks that are interested in a business, but then again, it's not every day you see something as unique as the Coffee Joulies come around. The two Dave's came back in the Shark Tank and announce that 4 sharks are better then 1 and agree to O'Leary and team's offer. Daymond John yells out "Ya Baby" realising that he just got back into a Great Deal that will make his investment back, we'll probably from just last night alone. A Fantastic Deal for All Parties Involved! Im sure it did if those sharks were given a cut of the tons of money these huge space takers made. I cannot believe how big these joulies are. there seriously is no room for my coffee in my cup! Ah sorry to burst your bubble but the coffee joulies are anything but a success story. Have you ever tried these very large joulies yourself? If not you might want to check out the reviews on Amazon with overwhelming negative reviews. Simply put, these do not work as good as they did on the Shark Tank. I thought these were way too big and you need way too many. I'm surprised you didn't mention their "phone a friend" Tim Ferriss of 4 Hour Workweek fame didn't get a mention. 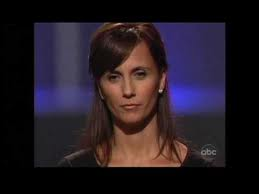 On the Shark Tank episode, as a demonstration they served coffee in a thermos that was made three hours prior. When a shark asked if the Joulies were actually working rather than the thermos doing its job, they answered, paraphrasing because I can't recall the exact answer, that the Joulies worked well in a thermos because they cool the coffee if it's too hot. What does that have to do with serving coffee that stayed warm in a thermos 3 hours later? I thought it was sham the way they demonstrated it and I was surprised the sharks bit.